Sleaford Mods, Calypso Rose, Yak, Requin Chagrin, Lolo Zouaï, Tierra Whack and Bamao Yendé complete the line-up for We Love Green 2019 as the festival pledges to go even greener. Returning to Bois de Vincennes public park on the Eastern outskirts of Paris on Saturday, June 1st and Sunday, Jun 2nd, it’s pledge to plant a tree for every visitor to offset carbon emissions. Powered by 100% renewable energy, We Love Green is a stand-out choice for environmentally-smart festival goers. Matching its capacity over the two days, 80,000 will trees to be planted with Ecosia (1 per festival goer) and all performers and artists will match their carbon emissions by funding local biodiversity conservation projects. We Love Green will be 100% single-use plastic free , sort all its rubbish, provide 100% dry toilets and serve 100% traceable, locally produced, organic food served. There will be four music stages, one Think Tank conference stage, art installations, banquets and more than 50 restaurants. This year there will also be a kids hub which will host kids aged three to 10 where they can become a mini-activist and make flower bombs, take part in the compost challenge and discover all about tides alongside concerts for kids. 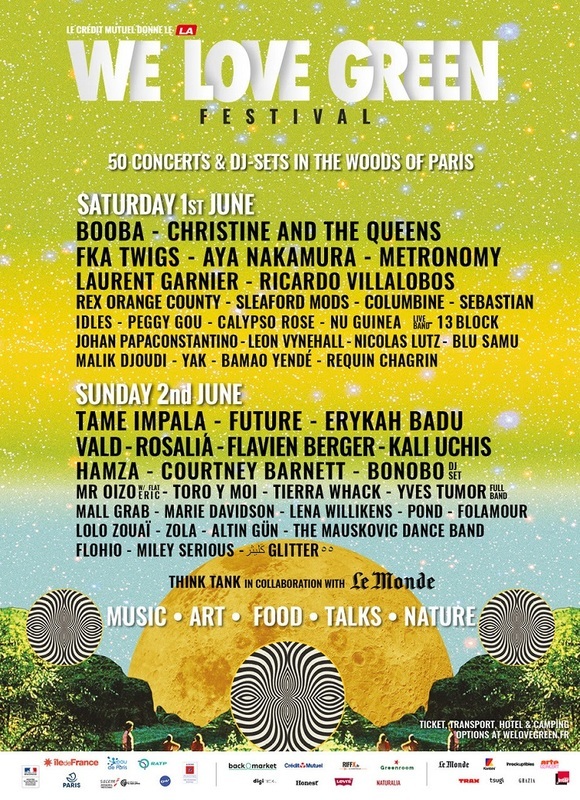 We Love Green’s headliners this year are Tame Impala, Christine and the Queens, Future and Erykah Badu. For tickets and details go to welovegreen.fr.